It depends on what your definition of ‘it’ is. They also ask if I’ve written any other books. Yes. Three or four. Depending upon what you count. Washed Up began as a novel called Capa City. The year was 1994. That first novel grew from a few emails I shared with a coworker, to novella length (around 100 pages). Versions of it were reworked during my early M.F.A. years at Hamline. A good chunk was written when my daughter was a baby, during the stretch of leisure time in 1996 more commonly known as a maternity leave. I stopped working on Capa City when one M.F.A. class came to an end, somewhere around 1997 or 1998. My instructor told me that the novel contained beautiful descriptions. So did the Minnesota State Arts Board, which passed it through one grant round but didn’t send it to the final round. People loved my lovely descriptions of landscape. However, not much happened either in the book or to that book. I was never sure what to do with my main character, so I killed her off around page 100. I began part 2 without her, and, well, that’s sort of the end of that story. You see, there’s this little thing called a plot…. I began another novel that I named Sleepwalking the Seals. It’s an odd title I know, and I can’t tell you what it means because I don’t know, I just thought it sounded quirky and interesting, two attributes the book didn’t end up having. That book was about a woman working in an office tower who spent a lot of time looking out the window. The main character, Lyra, is wandering through life unable to make decisions. She drives around aimlessly and takes up with a handsome slacker named Martin. Um. That’s about it. This is what we call not much of a plot, and to be honest, it’s semi-autobiographical and pretty boring. I stopped writing it. Then I began another book, Mr. Unbelievable, somewhere at the end of the 90’s. This book is about a pathological liar. It’s the genesis for another book I’m started writing late last year –Albert Park: A Memoir in Lies. Neither is finished, but Albert Park is now 100 pages long and I think it’s a promising book. I’ll get back to it again. The book was nominated for Outstanding Prose Thesis the year I graduated from Hamline’s M.F.A. program (2004). Judith Guest, the outside reviewer of the nominated works, called Lucid “beautiful and spare”. It didn’t win, and after multiple submissions to agents and publishers, it has not yet been accepted for publication. I’m not sure I’m interested in sending it anywhere anymore. Are you keeping track? It’s 2004. Ten years writing novels (Capa City, Sleepwalking the Seals, Mr. Unbelievable, Lucid) and there is one complete novel, a novella, and starts on other several works. Some might call this persistence. Or insanity. It’s a little of both. Budding novelists perform solo, often to an audience of none. You have to be crazy to do that. 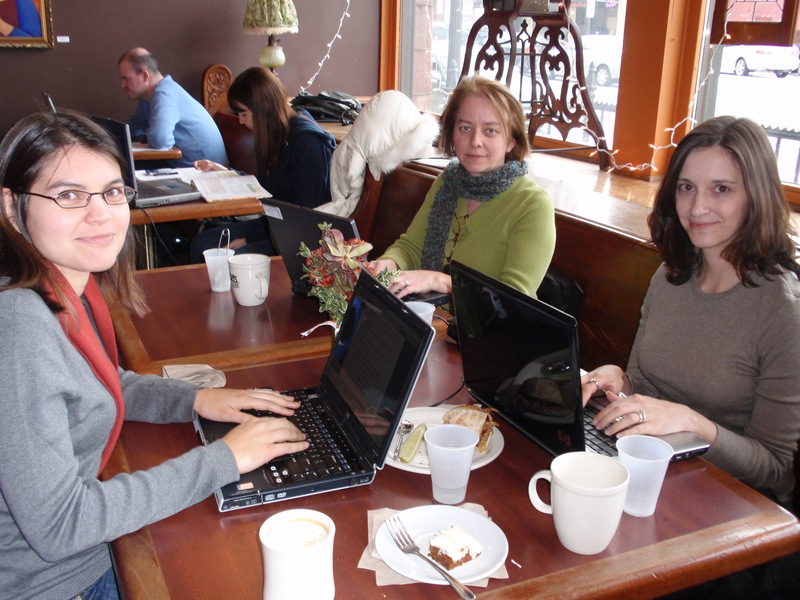 Four years later, writing group friends suggest we participate in National Novel Writing Month, an annual event challenging participants to complete a 50,000 word novel in a month. I’m game. A few months earlier I wrote my first mystery short story , featuring a detective named Arvo Thorson. I think of Capa City and decide maybe I can build on it – it’s a mystery after all, starts with a murder. Arvo becomes the main character, not right away, but gradually he takes over. The book gets a new name. Riverbaby. I finish my 50,000 words, but not the whole book, at the end of November 2008. I spend the next year revising the book, with the help of my writing pals. By 2009 it has a new name. Washed Up. I submit it, off and on, as my enthusiasm comes and goes. By the middle of 2010 I’m frustrated and completely depressed about writing. After a writing weekend in the country with Lindsay, Anika and Melissa, I’m ready to throw in the towel. The piece I write during that time is about my failure as a writer. I’m tired of being rejected. All this work that goes into a novel, years and years and years of work, and I have nothing to show for it but a lot of manuscripts scattered in boxes and across several computers. I think maybe I just don’t get it. I’m no good. No one cares. Sometime in the fall of 2010 I read of new releases from a Minnesota publisher, North Star Press. They specialize in books set in Minnesota and have a particular interest in Finnish-Americans. Hm. My book is set in Minnesota and has a Finnish-American detective in it. Well. Maybe. I sent it off late in 2010. I’m so used to rejection that I basically forget about it. In the meantime, I start writing — you guessed it — another novel. I’m determined to just write as I please and in a tear I write the first 100 pages of Albert Park. Chapter One gets accepted in a literary journal. What a whirlwind that phone call set into motion. Now I look ahead to September 1, only a few short weeks from now. I can’t quite believe it’s finally almost here, the day when I will hold in my hands a book I wrote, that others can read. I’m so happy that writers I respect have good things to say about it, a Library Journal review is imminent, and a major chain is carrying it. There’s still so much more to do, after the book launches. I’m prepping for some major regional publishing events, planning talks for the library, and scheduling events at bookstores. Onto the next phase. The one where I pitch, pitch, pitch Washed Up, go all out and finish the follow up book, maybe get back to Albert Park. What’s beyond that I don’t know. My only goal is to write the best books I can, and give readers something they enjoy. So how long did it take to write Washed Up? Somewhere between one month (November, 2008) and 17 years. How many novels have I written? Two. Plus or minus three. But who’s really counting. Not me! This entry was posted in Uncategorized and tagged book reviews, books, fame, mystery, nanowrimo, novels, Washed Up, writing. Bookmark the permalink.